I got your book on the 12 Days deal - what a story! You're amazing and the work you've done is nothing short of incredible. I'm just at the part where your Dad is helping you write on the blog after you're taken out of class.... I can't stop reading - it's so interesting and incredible. You have inspired me to think about widening my 10 year old son's horizons too. Congratulations on all the effort and work you put in - it is amazing. This must only be in your country.. it is $9.32 over here. :( I was looking forward to buying it. Thanks to generosity of Cargo Publishing, NeverSeconds at 99p, plus 25 meals to Africa. Think of it as a donation to Mary's Meals and free download of NeverSeconds. Please make sure you spread the word, download NeverSeconds for 99p. When Paulo Coelho made his entire back catalogue (excluding The Alchemist)available for 99 cents per download, word spread rapidly, and downloads shot up by over 4,000% within a couple of days. But more importantly it led to increased sales of real books. Nothing beats curling up with a real book. I just came across this site and absolutely love the pictures--gives great insight into the world of food at the elementary school level! Thank you for this! Fascinating to see, especially as someone who is interested in nutrition. Hi Veg and Veg's dad. I got your book for my new tablet and learned how to buy one and read on it. I'm really enjoying it, thank you. My grandson, who is 6, goes to school in London and they have a grandparents' day every year. the first year grandpa went but I got to go last year. We saw the children's work, joined them in class and I read them a story and then we had lunch with them. My grandson doesn't have school dinners as he and his mum are vegan, but I did and it was delicious! There was an individual fish pie as big as a 200 gram jacket potato in a sort of crust. It really tasted very good. There were big fat chips, and grandson was able to have most of those with his packed lunch. We also could have salad and fresh fruit, I think it was melon and pineapple, which grandson likes and had. I don't know if that was a specially nice lunch for Grandparents' Day or an average lunch. It was 10/10 for taste and healthy food. I'm going to show my grandson your blog when I collect him after school next week. I'd love it if he wanted to blog too. I think you will make a great journalist. Is this blog still active? It seems not. Have you given up now you rised the funds? The blog is never updated anymore!? I'm reading your book on my Kindle at the moment, thanks to your Dad for posting the offer link on Twitter! I've enjoyed reading about your trip to Malawi and have nearly finished the book so I hope you can post again soon to give me something else to read! 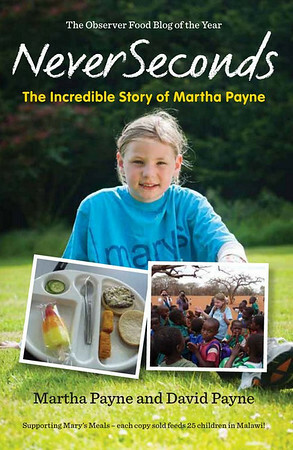 Martha, your school meals are costing £2-00 a head, around the world plus or minus a similar amount. How much are Argyll and Bute councillors spending on meals for themselves? It is worth finding out. You saw the spread they put on for them when they visited your school. In Lincolnshire the county council has spent £22,000 on meals for councillors since 2009! It is currently running at £17 a head, it was over £18 a head! For £18 they could walk into Lincoln and have a good meal in a good restaurant and spend less, therefore difficult to see how it comes to this figure when eating in the County Restaurant, their own staff canteen. No reason why they cannot queue up with a tray, same as everyone else. And it is served on a plate. It would appear to be a gravy train for councillors and meagre fare for growing kids. I just received my paperback copy of your book, Martha, and it is brilliant! Your dad tells the back-story of NeverSeconds, and your blogs are in there, too, all extremely well-written. Thank you so much for all you are doing to bring attention to the poor state of school lunches. God bless you! Miss Veg we miss you so much! Also downloaded to my Kindle! Excellent Book, Blog and Campaign too, Oh and Mary's Meals..... too! Well done Martha, David and the rest of the Family too! I think it's wonderful that you've found an opportunity to do this charity work, but I enjoyed the blog's original purpose: pictures and descriptions of daily school dinners. At this this point, it seems like the blog is devoted to promoting the book or Martha's upcoming appearances, when it's updated at all. Can you tell me if you plan on returning to the original theme and format soon? There are plenty of online venues dedicated to charities, but the earlier content of Never Seconds was unique and delightful; I imagine there are many others who miss it as well. I used to be excited when I'd get home from work and could see the newest entry. Apologies, I got some of the figures wrong for lunch at County Restaurant, the staff canteen for council staff. But as you can see, even with my corrected figures, no way does this come to £17 or £18 a head. A gravy train for councillors, compared with what Martha has highlighted, disgusting meals served for schoolchildren (at least in Scotland). I loved your book, as does my daughter who is 14. it made me cry so much ina good way! I like how your dad writes about you and him. I love the blog and what you are doing. I'm off to Kenya next week to do some teaching for a week. I am thinking the same, hope all is well with them! I saw a brief note in the Daily Record that you will be taking a break from your blog. Would it be possible to post a quick note on here so that others will be aware of this. Your posts will be greatly missed. I know it has been stressful as well as rewarding. You write with such intelligence and feeling that forget just how young you are. Thank you so much for everything that you have done for Mary's Meals and for all of us who read and enjoy your blog. Hello! I've been looking forward to new posts. Will they be restarting again? I hope everything's okay! I miss the new posts. Have you folks dropped off the map - or run your course? My simple little mind is still interested in seeing and reading about 'typical' school lunch meals from all over the world. Best wishes, -C.
I already had collected this book and it is simply awesome. Thanks a lot for sharing.